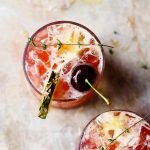 This cocktail can easily be made into a mocktail by simply omitting the rum. Steep the hibiscus and thyme sprigs in the hot water for 5 minutes. Then discard the hibiscus and the thyme and cool to room temperature. Then add in the honey. Stir to dissolve and refrigerate until cooled completely or until you're ready to use. If honey isn't your thing, you can use any sweetener you desire. Simple syrup, maple syrup, liquid stevia, etc.